Do you know what your Superpower is? I’ve known Kelly for almost 3 three years and ever since the 1st day I met her, I have referred to her as my #worthy coach. She has this amazing ability to reinforce your enough-ness and make you feel so good about yourself! 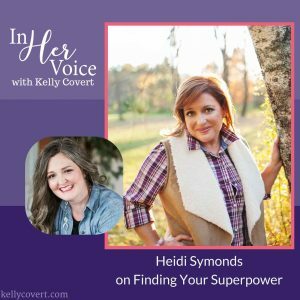 I had the honor and the privilege of being a guest on her new Podcast, “In Her Voice.” She’s a powerhouse of a coach and wasted no time in getting right into the meat of the work we are both passionate about. How I knew from a young age that I was born to be a nourisher. What it’s like to be a highly sensitive person. How it feels when you know you are where you are supposed to be inside of yourself. Creating flow and grace in our transitions. The importance of being resilient. Masculine vs. Feminine Qualities and the importance of all of them. Leading in the way YOU are supposed to lead. Why it is critical to recognize our own superpowers. Worth and it’s intrinsic value that never changes. What it means to nourish. My gratitude practice for things that have yet to come. Click HERE for a little taste. To listen to the podcast while you putter around your kitchen or walk your pups click on the player below. I can’t wait to hear what your superpower is! Will you contact me HERE and share it so I can celebrate it with you? Also, be sure to visit Kelly’s website for more inspiring episodes with game changing women and other feeling worthy tips and inspiration.